Pond Management VISIT OUR SHOWROOM! 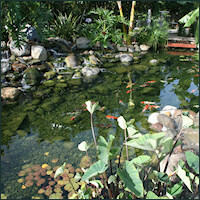 We offer full service pond management that serves customers all over Southern California. Our main areas of service are detailed below. From equipment installation to consultations and hands-on services, we have the capabilities to help you with all aspects of your aquatic management needs, large or small. Maintaining service accounts for homeowners, businesses, commercial and homeowners' associations, Kan-Do Ponds Management Services has treatment programs to keep your ponds and lakes in optimum condition, in even the warmest climates. We specialize in balancing the aquatic environment through the use of a variety of treatment options and equipment. Our treatment program focuses an integrated maintenance approach that couples the use of beneficial microorganisms along with limited specific chemical treatments. We achieve the results our customers have come to expect. By using advanced formulations of beneficial bacteria in conjunction with the selective use of other maintenance products like algaecides, herbicides, flocculents and defoamers, we can give you the pristine results you want at a cost that's affordable.